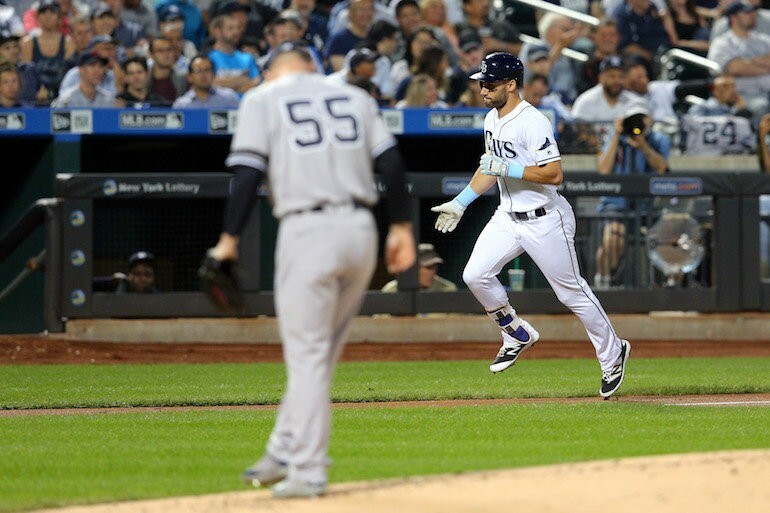 The Yankees picked a bad night to go dry offensively as they fell to the Tampa Bay Rays despite a solid complete game effort from Sonny Gray. In the end, it was two misplaced pitches that were deposited into the outfield seats that helped the Rays overcome the Yankees. If the Yankees fall short of their bid to win the AL East, they'll look back at games like this and wonder what could have been. 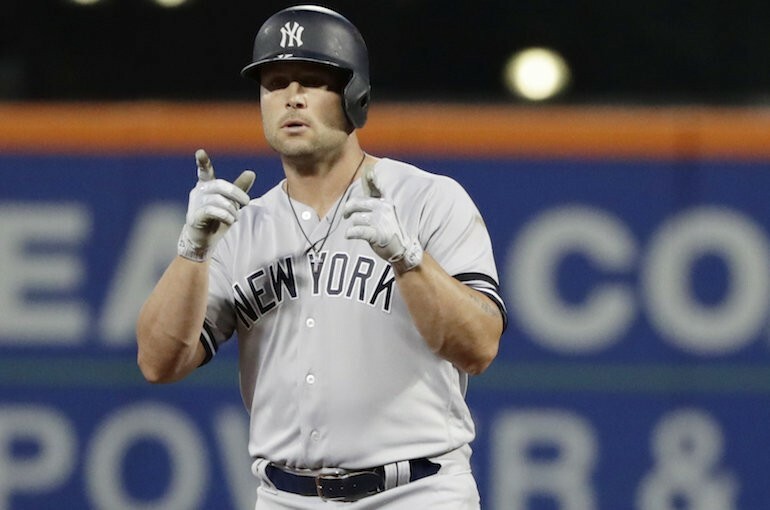 Matt Holliday put the Yankees on the board first. Aaron Judge took a one-out walk in the top of the 1st inning, his 110th of the season to extend his own MLB rookie record. He moved to second on a slow rolling ground out by Gary Sanchez. Matt Holliday laced a double to left when the ball went under the glove of left fielder Corey Dickerson, scoring Judge. But Holliday was left stranded when Starlin Castro followed by striking out. The Rays wasted no time in answering the run. Rays leadoff hitter Kevin Kiermaier jumped on the first pitch by Sonny Gray to send it over the center field wall. As YES Network announcer Al Leiter said, "Welcome to the game, Sonny Gray". Gray rebounded and found his groove, shutting the Rays down until the 8th inning. Unfortunately, he left a pitch high and over the middle of the plate for Adeiny Hechavarria and the hitter did not waste the opportunity. He got all of the Gray pitch to send it over the wall in left center. The Rays had their first lead of the game, 2-1. Meanwhile, the Yankees just couldn't get any going. Rare was the inning they sent more than three men to the plate. 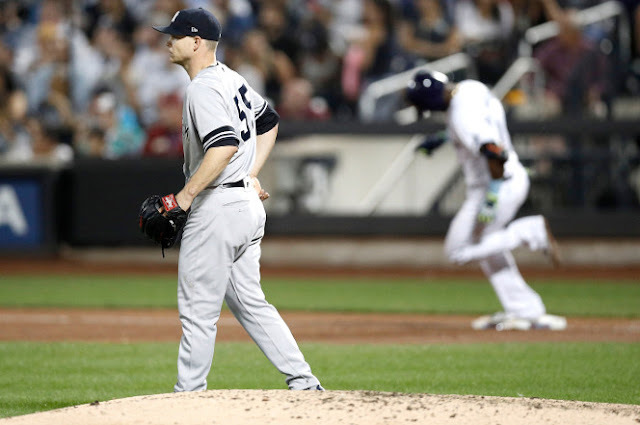 A 5th inning walk by Todd Frazier, a 6th inning single by Brett Gardner, and a 7th inning single by Chase Headley were the only baserunners that the Yankees could get. Unfortunately, none could get past first base, thanks in large part to ten strikeouts by Rays starter Blake Snell and the bullpen. The Yankees bowed out quietly in the 9th against Rays closer Alex Colome who picked up his 44th save. The Boston Red Sox beat the punchless Oakland A's, 11-1, so they increased their AL East lead over the Yankees (78-66) to four games. The Minnesota Twins scored two touchdowns and a safety in destroying the San Diego Padres, 16-0 (hey, it's football season, gimme a break!). So, the lead in the Wild Card Standings shrank to three games. 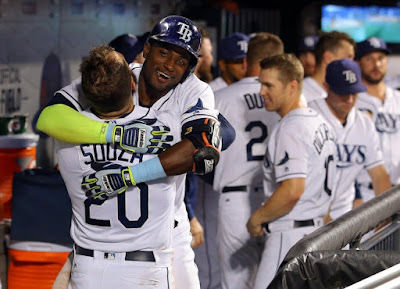 The Rays were able to leap-frog the Baltimore Orioles for third place in the AL East with the win. They are 7 games behind the Yankees. The O's lost a close 3-2 game to the Toronto Blue Jays. Sonny Gray's final line was great. He pitched 8 innings and only allowed five hits, two runs, and one walk. He struck out five. But the killer was two home runs out of 94 pitches thrown. Run support has not been Gray's friend during his short Yankees career. In his five losses as a Yankee, he's been backed by four runs. 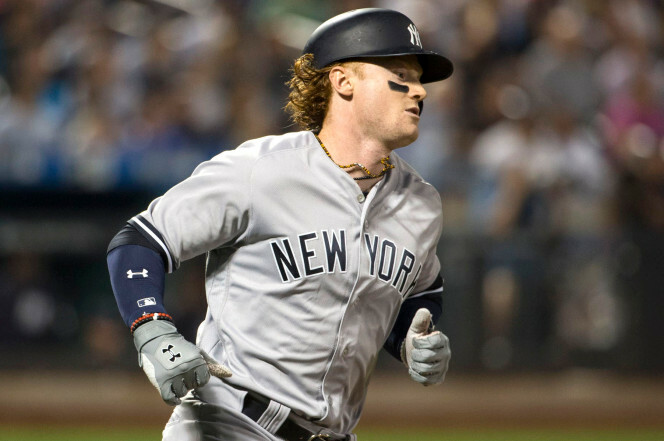 Clint Frazier, making his return from the disabled list, tried. He had a couple of deep balls in his two at-bats, the second of which would have been met with "See ya!" from Michael Kay had the game been played at Yankee Stadium. Instead, it was just a running catch by Rays right fielder Stephen Souza, Jr. I wish I had more optimism about today's game but it is hard to get excited about Jaime Garcia, especially when he is going against Chris Archer. On paper, it looks like a mismatch in favor of the Rays. The Yankees have had a fair amount of success against Archer so hopefully this afternoon will be another one of those times. We need runs. Hopefully the offense decides to bring their bats for the series finale. 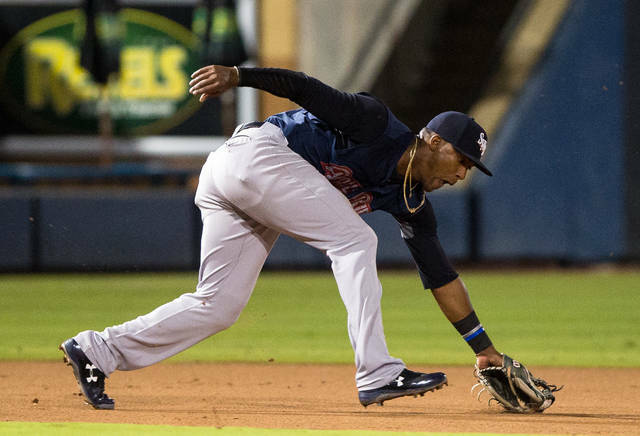 It was also a bad night for the Triple A Scranton/Wilkes-Barre RailRiders as they dropped Game 1 of the International League's Governor's Cup Finals to the Durham Bulls (Rays), 6-0. The losing pitcher for the RailRiders was starter Ronald Herrera. Not much offense as the RailRiders were only able to pound out three hits (two by Mason Williams). Game 2 is scheduled for this evening in Durham, NC. Domingo German gets the start for the RailRiders. The losing continued with the Double A Trenton Thunder as they dropped Game 1 of the Eastern League Championship Series to the Altoona Curve (Pirates) by a score of 2-1. The losing pitcher for the Thunder was Dillon Tate, who like Sonny Gray pitched a great game. But at the end of the game, the scoreboard showed more runs for the other team. Game 2 will be this evening in Trenton, NJ with Justus Sheffield on the mound for the home team. Have a great Wednesday! Let's make it a Winning Wednesday for the Pinstripers and their top farm teams! Go Yankees...and RailRiders...and Thunder!